It’s getting colder and knitters everywhere are reaching for the sock wool. In such circles, October has been renamed Socktober and many pairs of lovely warm hand-knitted socks will be added to their wardrobes. I tend to knit socks all year round but have a few more on the needles and have certainly started wearing woolly socks again now I won’t melt from the heat. 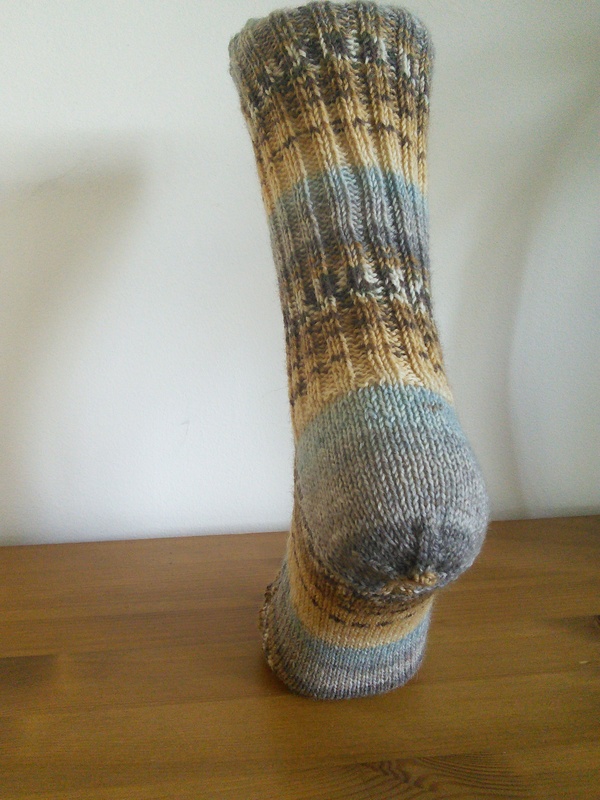 My self striping sock obsession shows no sign of stopping any time soon and I’ve been investigating some of the different heels from Sock Architecture by Lara Neel. I reviewed this book in February and am still finding it very interesting and useful. 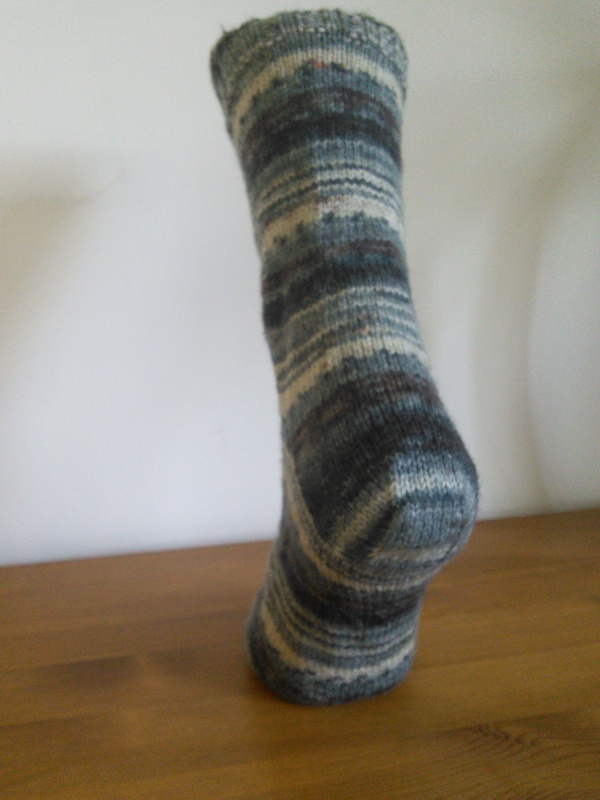 The first exhibit is a sock knitted in Opal Schafpate yarn in the Fausto colourway with a band heel and a round toe. This heel has a gusset before the heel turn, matching the shape of a heel really well. I tend to make toes by default and haven’t tried as many of the options in the book but for these I used the round toe. This makes a very subtle toe as the decreases are too far apart to form a recognisable line. 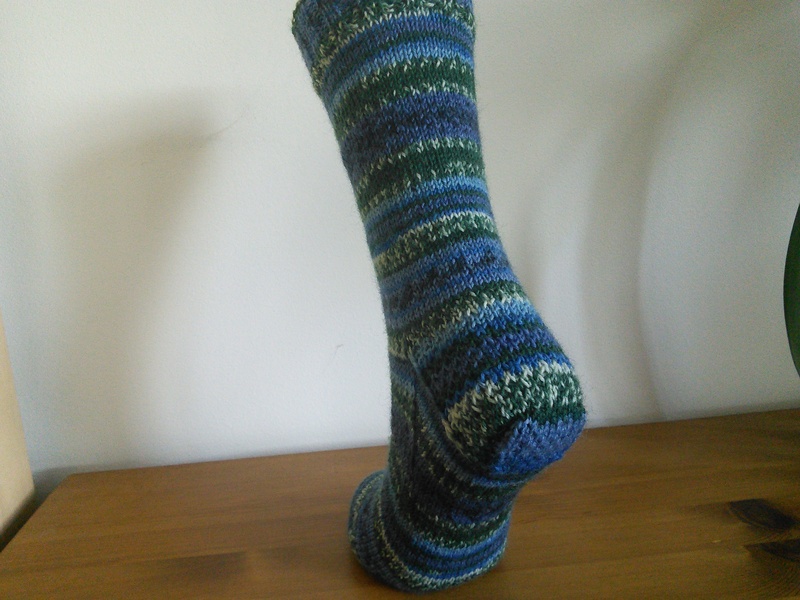 Next we have some Opal Sweet and Spicy socks in the Sternanis (star anis) colourway with a Balbriggan heel. I really like the colours of this yarn, I tend to go for a cooler colour palette but I think this works really well. I found this heel very interesting to work as it doesn’t involve a heel turn and requires grafting. It doesn’t fit as well as some of the other options, the heel tends to drop below the level of the sole and stick out a bit. The last sock with an interesting heel (there was one with a normal heel but that was mainly to give me something to knit and try to stay awake while watching the election results come in) is in Regia Arne and Carlos yarn in the Winter Night colourway with a square heel. I made these for my sister’s birthday as I am slowly converting her to the wonders of hand knit socks (they work especially well with her cold and draughty grade 2 listed cottage). The colour pattern on this yarn is amazing, really detailed without being overpowering. I decided I didn’t want to interrupt this pattern with a heel, so used an afterthought heel with gusset. I worked the heel flap in eye of partridge stitch which also helps to not interrupt the colour pattern and I also continued the eye of partridge onto the square heel flap. My sister is notoriously hard on her clothes, so I thought the extra protection might come in handy. The square heel is quite similar to the band heel but without the gusset before the heel turn. I found the instructions for the square heel were a bit sparse, not up to the standard of the other heels in the book. I think this was more noticeable with the afterthought heel as I had to calculate how many gusset stitches to provisionally cast on. BritYarn is holding a Great British Socks Away KAL, with the aim of knitting a pair of socks between 1st October and 8th November out of British grown yarn (or local to you if you do not live in Britain). I’m going to try to reknit a sample from one of my designs. The first attempt had a bad combination of short yardage yarn and a too large sock, meaning I ran out of yarn to knit the toe on the second sock. Therefore, I’m starting again with some Eden Cottage BFL Sock in Antique Rose with smaller needles and hopefully it will work better and I might eventually get around to publishing the pattern nearly two years after I first started it. Previous Previous post: Sheep, Alpacas and a Dog, oh my!